It was more than six months in the making and took a cast of hundreds. Despite people singing different parts of Bluffton’s song, the chorus was overwhelmingly in unison: Everyone shares a great love of Bluffton, which is the theme that directed the new brand. How does a town convey that deep love and speak to different groups with very different reasons to be in Bluffton? The answer is the new brand: Bluffton – Heart of the Lowcountry. It was almost an impossible task to make one slogan speak to prospective businesses, residents, future residents, tourists and lifelong locals; however, there is a message for each. According to Sulka, those perceptions are far from reality as Bluffton is taking a leadership role in many municipal initiatives and putting programs and projects in place to self-direct its economic future. It needed a new image to more clearly reflect Bluffton. “Bluffton is the first non-metropolitan town or city in South Carolina to establish its own business incubator, known as a Clemson Technology Village. We are now an example and a mentor to other municipalities. Bluffton was also the first local Lowcountry town to form a Public Development Corporation. That organization recruits, negotiates and assists prospective companies to locate here,” Sulka said. The intensive research conducted during the branding process indicated prospective businesses needed to be centrally located along the Eastern seaboard, near larger cities and transportation hubs while their employees could enjoy the high quality of life of a classic coastal village town. This slogan also resonates with Bluffton’s ever-growing tourism audience. “Heart of the Lowcountry” also indicates that Bluffton is strategically located between the tourist-draws of the world-class resorts of Hilton Head Island, the historic Savannah sites and antebellum beauty of Beaufort. The “heart” indicates that the town is a beating pulse of the Lowcountry, not just an afterthought or a two-hour detour for tourists. 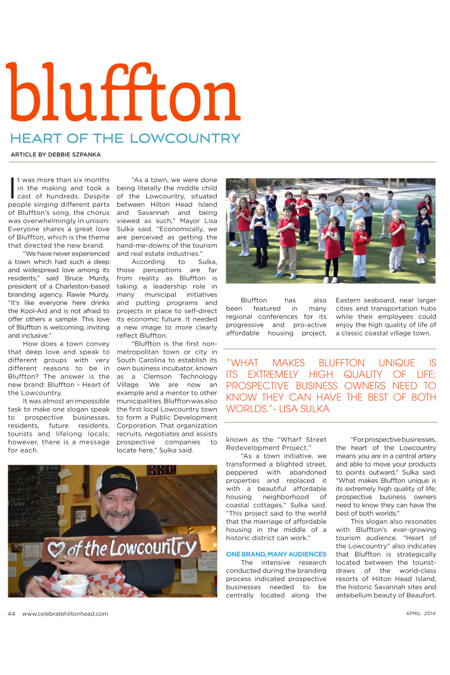 As a “heart,” Sulka said, Bluffton has its own beat as well as keeping other parts of the Lowcountry alive and well. Perhaps most important, the town’s beloved residents can wrap their hearts around this new slogan. Many have already shown Town Council members and staff where their heart is by submitting photos of their interpretations. Two yogis formed a heart as they stretch their bodies upside down; Chef Richard Canestrari of Pour Richards made a pizza with pepperoni hearts; Pastry Chef Ally Rogers designed a table-wide heart of fresh vegetables and wine; and students at the May River Montessori School arranged themselves as a large heart on the playground. “This is a brand people can make their own,” Sulka said. Murdy, who has facilitated numerous branding exercises of towns and cities, said there is no way to get 100 percent buy-in; there will always be people who have a different opinion of what the brand should be. For some, the longtime Bluffton brand, which was developed decades ago when Bluffton was one-square mile, is still their favorite. As a celebration of the new brand, the town wants to know what your Bluffton heart looks like. The Town of Bluffton, along with the Society of Bluffton Artists (SOBA) and the Hilton Head Island-Bluffton Chamber of Commerce, is hosting an art contest and exhibit for the new Bluffton brand. Submit your photographs, paintings, drawings or sculptures of how you interpret the new brand. An awards ceremony will be held Thursday, April 24 at the SOBA’s Center for Creative Arts, 6 Church Street, from 5:30 – 7:30 p.m.
For more information, call the Town of Bluffton’s public information department at (843) 706-4500.